India is facing threats in both traditional and non-traditional realms of security. The proposal to have cyber, space and special forces commands has been long pending with the Union government. Retired lieutenant general Philip Campose, former Army vice chief, believes that, unless India's strategic goals are clearly articulated and professed, and subjected to periodic review based on experience, there cannot be a concerted and coordinated approach towards the achievement of those goals in a time-bound manner. He also feels that the Indian military, especially the Army, needs to undergo transformation and “right-sizing” towards becoming an optimised modern force, with a more efficient teeth-to-tail manpower ratio. 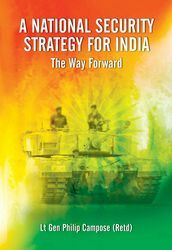 Campose, who had an illustrious career spanning more than four decades, has brought out these key issues in his book titled A National Security Strategy for India: The Way Forward. The book enunciates a possible national security strategy—as part of a grand strategy—that would make the country achieve its goal of becoming a major global power by 2050. After the Pathankot terror attack on January 2, 2016, a panel was formed under Campose to review the existing security infrastructure. The panel emphasised the need for timely military modernisation. As per current estimates, the armed forces require about Rs27 lakh crore over the next decade to meet the modernisation needs. Campose opines that the government must initially increase the defence allocation (excluding pensions) to 2.5 per cent of the GDP, and, subsequently to 3 per cent, till the completion of modernisation of the forces. The book emphasises that the military must achieve multidimensional and cross-spectrum (nuclear, conventional and sub-conventional) war-fighting capability to achieve a favourable outcome even in a two-and-half front war scenario. Campose also mentions the disproportionate stress on “sub-conventional warfare” in the recent years. The book opines to ensure credible nuclear deterrence consisting of an appropriately-sized “second strike capable” nuclear arsenal, backed by suitable nuclear doctrine.